In this topic you will learn how to provide the ability for viewers to download specific videos from a portal experience. If you want to provide a download link for all videos, see Customizing the Video Settings for a Portal Experience. Portal experiences can be configured to display a download link allowing viewers to download video content. Sites can be configured to provide a download link for all videos or specific videos based upon a custom field value. When a video is downloadable, a download link will appear next to the video. The highest quality MP4 rendition available is downloaded. Note: YouTube videos can't be downloaded. Note: For information on creating custom fields, see Creating Custom Metadata Fields. Set the value of the custom field as appropriate. In this example, the value of Downloadable is set to True. Edit the custom field value for any additional videos as required. To configure a portal experience to allow video downloads, follow these steps. Locate the experience and click Edit. Click VIDEO AND PLAYBACK > Video in the left navigation. 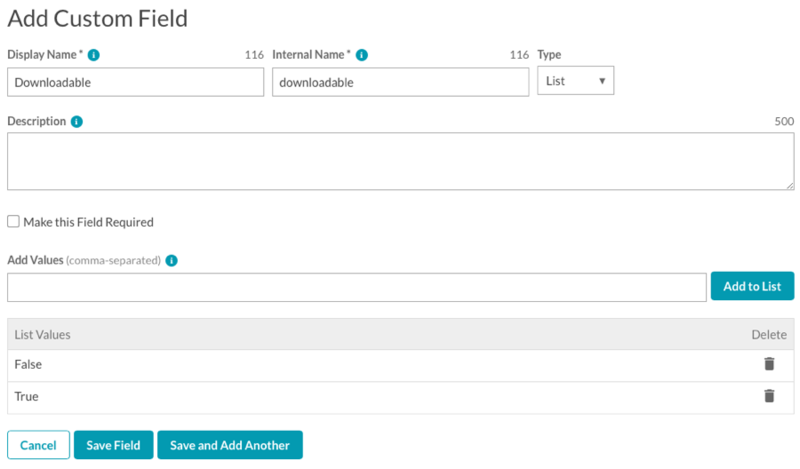 To indicate that videos to be downloaded are based upon a custom field, in the Video Download section, select the Provide a download link based on a custom field value option. Enter the custom field name and the value that were created earlier. In this example, the custom field created was named downloadable and the value was set to true for videos that can be downloaded. Confirm that a Download Video link appears with the video(s).